Minirig: It's available in all sorts of colours, but we say just grab a black or grey one, throw it in your bag, and you're never going to be without sounds, anywhere you go. Minirig speakers sound great, they are louder than any speaker this size has any right to be, and are clearly made to a different quality standard than even the best of the competition - something you only have to pick one up to understand. From a boutique UK company, these little speakers now pack an incredible 80 hours of play time, and are also designed to be able to charge your phone fully up to three times. That's pretty cool. They come in lots of snazzy colours including an engraved design, you can buy them in pairs to use in stereo, and there's even a subwoofer available for a wireless "2.1" system. But for me it's all about a single one of these, thrown into its well-made tubular zip-up nylon case, along with all of its leads, and stashed in the bottom of my hand luggage as I travel. For use with an iPad DJ app in a hotel room, to stream online radio or Spotify anywhere away from home, or - as I can attest to - filling a room of 20 people with enough sound to party, much to the amazement of all present (including me, I have to be honest), I have nothing but praise for Minirig. And let's be frank, 80 hours of play time from a rechargeable portable Bluetooth speaker really is something else. Oh, and what other speaker manufacturer has locally flavoured DJ mixes on its website? Do you own a Minirig? Can you attest to the quality of these little gems too? 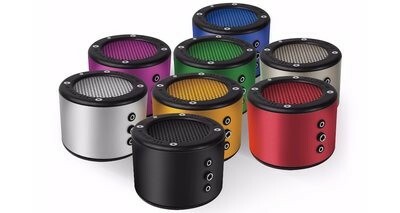 Or is there another tpye of portable speaker you swear by? Let us know in the comments.